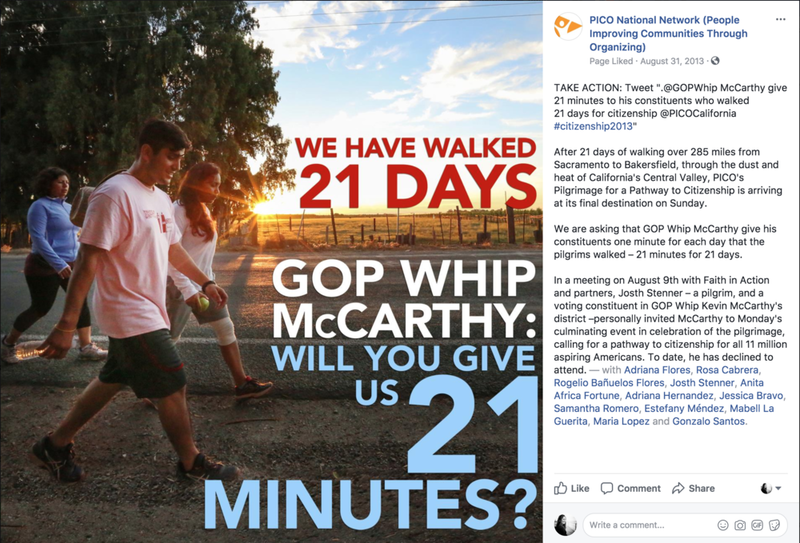 As an immigration reform bill stalled in the House of Representatives, fifteen pilgrims set out to walk the 285 mile journey from Sacramento to Bakersfield, CA, culminating in a 3-thousand person event at the office of House Majority Whip Kevin McCarthy - urging him to create a pathway to citizenship for 11 million undocumented immigrants in the U.S. The pilgrimage was paired with a grassroots organizing strategy in each city - door knocking to inform the community and build an active base of pro-immigration reform low-propensity voters. And with a robust digital organizing strategy to both nationally amplify pilgrim stories and build public pressure on Members of Congress unconfirmed to meet with the pilgrims and their constituents. Pilgrims begin walking each day at 4 AM - the heat in the Central Valley becoming unsafe for them to be on the road after 1PM. At each stop along the route, the pilgrims - representing PICO California, its 19 affiliates and 480 congregations - are urging their Members of Congress to support an immigration bill that focuses on an affordable and attainable pathway to citizenship. Rep. Jeff Denham speaks in public for the first after coming our in support of immigration reform, saying, "I want to fix this. We have to fix this. We can't allow either party to have anymore excuses - we need both parties to come together. This is about fixing our broken immigration system once and for all." Thousands gather at Rep. Kevin McCarthy's office in Bakersfield, Ca., at the end of the pilgrimage, calling on Rep. McCarthy to meet with the pilgrims and to champion immigration reform in the House.